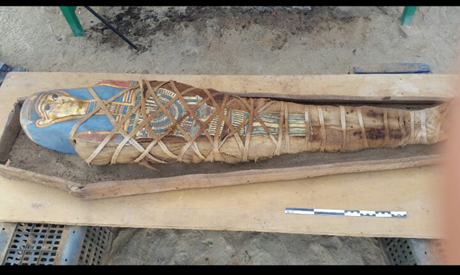 During excavation work carried out at the Deir Al-Banat (Al-Banat Monastery) archaeological site in Fayoum, an Egyptian-Russian mission from the Russian Institute for Oriental Studies discovered a wooden Graeco-Roman sarcophagus with a mummy inside. Mostafa Waziri, the secretary-general of the Supreme Council of Antiquities, said that the sarcophagus is in poor condition, with cracks all over its lid and base. The mummy, however, is well-preserved. He explains that the mummy is wrapped in linen and has a blue and gold cartonnage mask. The mask is decorated with scenes depicting the sky deity Kheibir, while the mummy's chest is decorated with the face of the goddess Isis. The legs have an image of a white sabot. 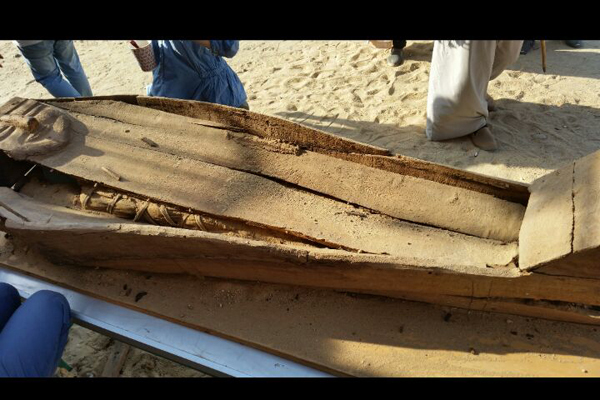 Mohamed Abdel-Latif, head of the antiquities ministry’s Coptic and Islamic Antiquities Department, said that the sarcophagus and the mummy underwent conservation work at the site before they were transferred to Fayoum for restoration. Abdel-Latif said that Deir Al-Banat is known for its Islamic and Coptic antiquities, with its Graeco-Roman necropolis and early Coptic churches and cemeteries.